News - Manna's Hana Riding Center, Inc.
Join us for light refreshments and watch some of our riders in a leeson, take a selfie with one of our horses. 1 1/2 hours of hands-on learning all about horses from making horse treats, learning how to groom, pasture maintenance and crafts. AND eating lunch in the country air. Manna's Hana Riding Center's "Lambs 2 Lions" youth at risk program is a closed session for girls from our local schools and meets on Tuesday morning for 1 1/2 hours. COOKEVILLE — When Manna’s Hana Riding Center opened five years ago, facility owners Bobbie and Paul Abell had no idea how much it would grow and how many lives it would touch. “This program affects not only the child, but also their families and the schools,” Bobbie said. It all started years ago when a woman named Carolyn Acuff started having a strange dream. It was of children riding horses. She had owned horses in the past and her children had ridden them, so at first she just assumed that’s what she was dreaming about. However, she started to notice that the horses and children didn’t look right. Then during one of the dreams the children turned around — she realized they weren’t her kids. She believes it was a vision of things to come. It was 10 years before she shared that dream with anyone. Bobbie and Paul owned a pair of horses. One day while volunteering with her church, Bobbie witnessed a boy take his first steps shortly after having his first riding lesson on a pony. The joy on the boy’s face and on the faces of his family made her decide she wanted to help more children like him. When the Abells met Acuff through mutual friends, passion and vision combined and they formed a board which created Manna’s Hana Riding Center. 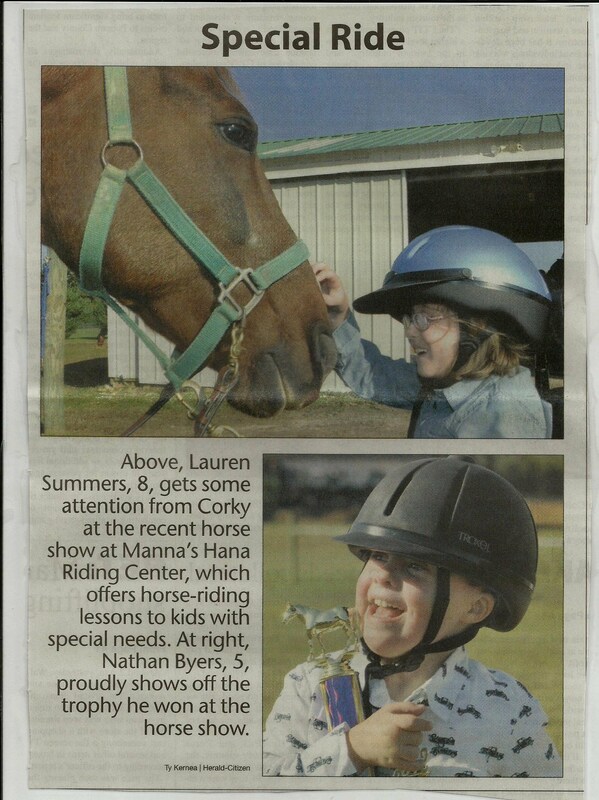 The program provides horseback riding lessons for children with physical, mental or emotional challenges. This past year, they worked with 18 students, most of whom are from Putnam County, with a few from White County and one from Sumner County. They ranged in age from three — though typically five is the youngest they accept — to 39 years old. The challenges the children face ranged from cerebral palsy, Downs Syndrome, and autism to spina bifida, visual impairment and sensory processing disorder. They all gain something from the lessons, such as better balance, muscle control or communication needs. Bobbie’s favorite part of working with the children is being able to witness what she calls a student’s “breakthrough moment,” when the child really connects with the horse and makes strides in overcoming their physical or emotional challenges. One of her favorite memories is watching a boy suddenly pause in the middle of grooming one of the horses and drape himself gently over her side. After a few moments, the volunteers working with Bobbie asked her what they should do. The boy finally pulled away after nearly 10 minutes, and his disposition was noticeably more peaceful. There are also cases of children becoming more verbal, gaining self-confidence and seeing health improvements. Because of the success of the program, the board is hoping to be able to purchase an indoor arena. The model they have in mind would have a rounded canvas architecture that would be easy to dismantle and move if the need arose. Currently, all of the horseback riding lessons are given outdoors, where they are at the mercy of weather conditions. This past year, Bobbie’s records show that 36 outdoor lessons were rained out. When it rains, volunteers do have the option of bringing the students indoors for educational lessons about horse care. So far, they have raised $3,000 toward the indoor riding facility, but will be going into the new year trying to raise $9,000 more. 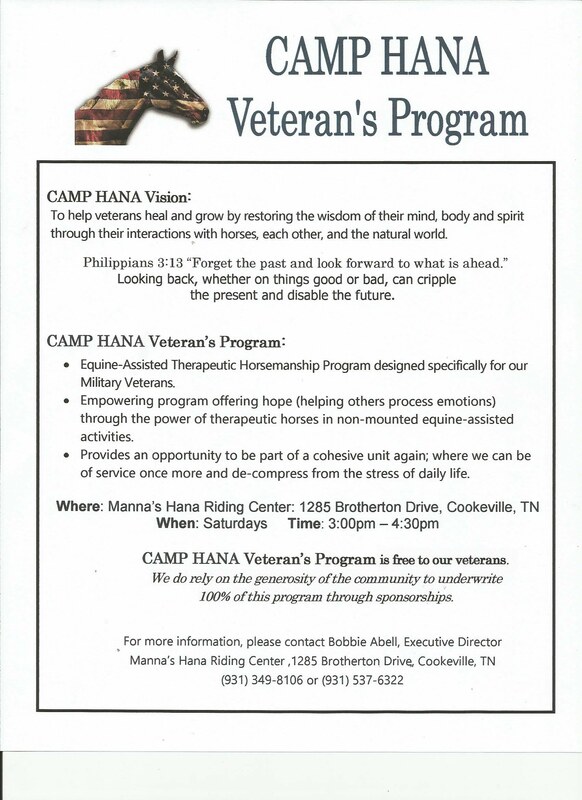 Anyone interested in donating can visit www.mannahana.com or mail donations to Manna’s Hana Riding Center, 1285 Brotherton Drive, Cookeville, TN 38506. The center will also being opening up their doors for more volunteers. Volunteers will be able to help with a variety of tasks, such as leading horses, walking beside students while they are riding (“side-walkers”), barn chores, helping with educational classes and more. Experience with horses is not required. Anyone interested should call 931-349-8106 or email mannahana@gmail.com. Next year’s volunteer training will be held from 9 a.m.-noon on March 19, and mock lessons to help prepare volunteers for the jobs before students arrive will be held March 24-26. For those interested in enrolling their children, an open house will be held from 1-3 p.m. March 12. Lessons will begin March 31-April 2. Lessons are $25 each, but scholarships and financial aid are available. “I just can’t wait to see what God has in store for next year,” Bobbie said. Isaac Snell takes his first ride on Buttercup the minature horse in the round pen assisted by, from left, Macy Coomer, side-walker; Rachel McCormick, leader; and Bobbie Abell, side-walker. Heather Wheeler, 12, hugs her second place trophy that she won at this year’s riding show at Manna’s Hanna Riding Center, while her horse is led by Paul Abell. This was Wheeler’s first time to participate. Join us on Saturday, May 5, 2018 from 3:00pm - 5:00pm to view the facilities, meet the horses, get a bite to eat and watch a live demonstration of what will be happening during a Camp Hana Program. Children will have a chance to ride a stick horse around an obstacle course. Paul and I wanted to wish everyone a very Merry Christmas and blessed New Year. What a horse does to the inside of a person is truly magical!